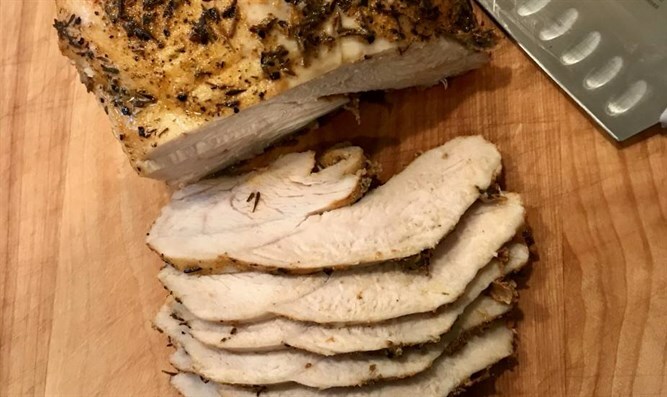 Yes, cooking a moist turkey breast IS possible. Follow these directions for an outstanding special meal. Using a boning knife, carefully remove the breast bone from the breast meat. Reserve bones and breast meat. Heat a large Dutch oven (or pot with a lid) add the oil and heat. Sear the Empire® Kosher Natural* Turkey Breast on both sides. Remove from the pan to a large dish and reserve. To the same oil, add the onions, carrots and celery. Cook for 10 - 12 minutes over medium heat until onions and celery just begin to color. Add in the potatoes, garlic, rosemary and smoked paprika. Cook, stirring occasionally until fragrant, about five minutes. Pour in the Empire® Kosher Organic Chicken Broth and move the cooked vegetables to the outer edges of the pan. Place the reserved breast bone in the bottom of the pan to use as a natural rack. Place the seared turkey breast on top. Pour in any residual meat juices from the dish. Roast in the oven for 60–75 minutes and until a meat thermometer reads 165 degrees Fahrenheit. Remove from the oven and allow the turkey breast to rest at least 15 minutes before carving. Slice thin and serve with the roasted vegetables and pan juices.